- We have the best adventure trekking guides and staff. Action Peru Treks specializes in providing superior quality treks and tours with the goal of exposing others to the magnificent culture and history of this Sacred region. When you trek with us we will provide you an experience beyond imagination! Our mission is to help our trekkers and tourists see and experience things they never knew they wanted to see until they saw it or experienced it! Do I need an Inca Trail permit? Yes! Please ensure that there are permits available on your date of travel before you book your tour, as the Peruvian government only allow a small number of trekkers and permits per day to preserve the natural beauty of the Inca Trail. Please contact your Travel Expert for permit availabilities. Are there any physical requirements for my tour? All of Action Peru Treks are challenging and often take place on rugged and isolated terrain. It is recommended that you are reasonably fit and healthy to fully enjoy your tour. Please consult your doctor if you are concerned with the altitude or your ability to trek through the Andes. All meals will be provided on your tour and are prepared by chefs who have experience cooking in the middle of the mountains! How cool is that!? Please notify your Travel Expert of any dietary requirements that you may have when booking your tour to ensure Action Peru Treks can accommodate your request. What altitudes can I expect? You can expect to experience altitudes from 10,000 feet up to 17,000 feet. We recommend staying a few days in Cusco before your tour to adjust to the altitude, particularly if you are prone to altitude sickness. Please consult your doctor if you are concerned with the altitude. Tipping is not included in your tour cost. While tipping is not required, it is a common practice in Latin America. If you feel your guide and crew went above and beyond to make your trip special, tipping would be greatly appreciated. 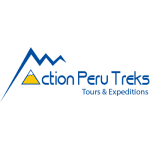 Action Peru Treks vs Explore!